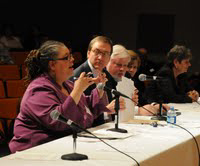 Chicago Teachers President Karen Lewis speaks out against the "Performance Counts Act" at a hearing of Illinois' Special Committee on Education Reform. On her right is Daniel Montgomery, Illinois Federation of Teachers president. Photo: George Schmidt, Substance News.